This post is a little late, since I already posted these on my Instagram a while ago, but here goes! One of my favorite polish makers, Jessica from Messy Jessi contacted me about swatching her collection inspired by the television show The Walking Dead, so of course I said yes!! This collection consists of 4 beautiful shades perfect for the fall and for Halloween. First up is the one that immediately caught my eye. This one is The Governor's Eye. 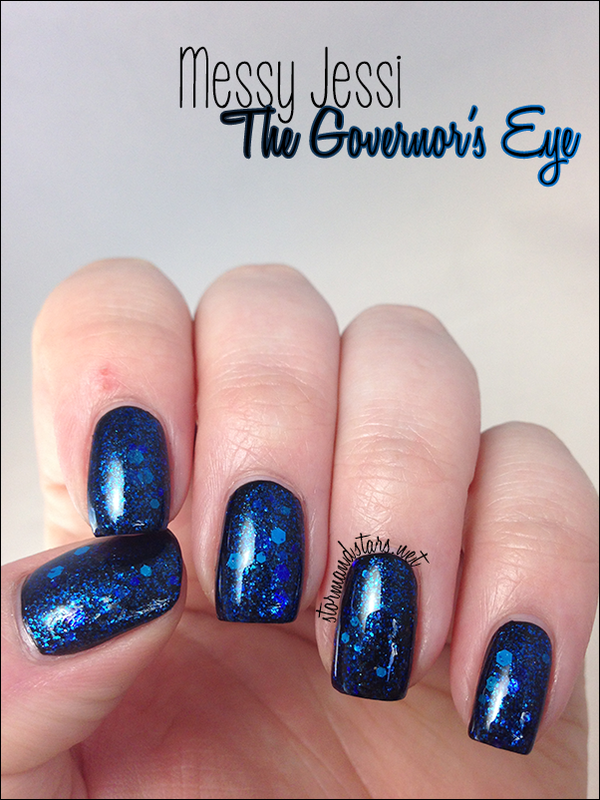 The Governors Eye is a bright shiny mix of blue glitters and shimmers in a black jelly base. I absolutely love this color and it is so much fun to wear! 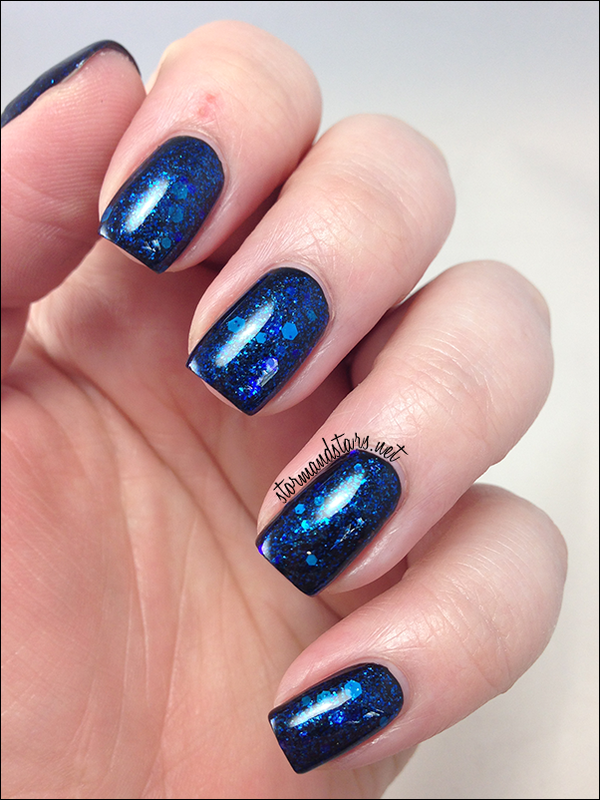 I used 2 coats over black plus topcoat for these swatches. As usual for Messy Jessi, the formula on this lacquer was flawless. I'll definitely be wearing this baby through the fall and winter months! Next up is the most original of the bunch, Biter Blood. 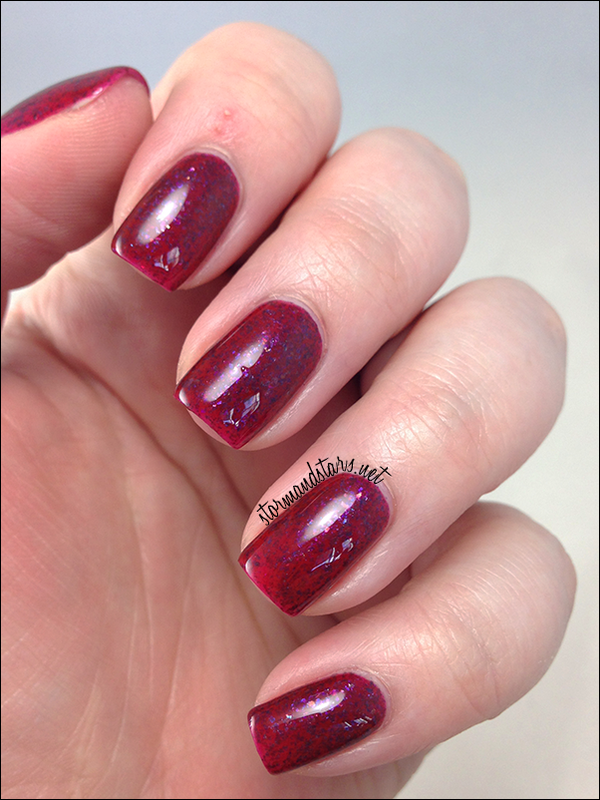 This lacquer is definitely different. 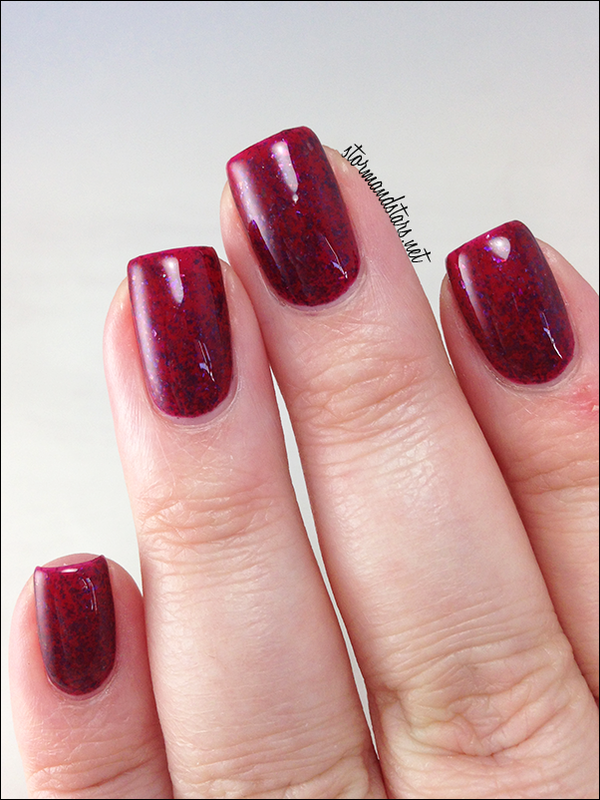 There are lots of flakies stuffed in this deep red polish and they shine really pretty in the light! I really liked this one a lot more than I thought I would when I saw it in the bottle. 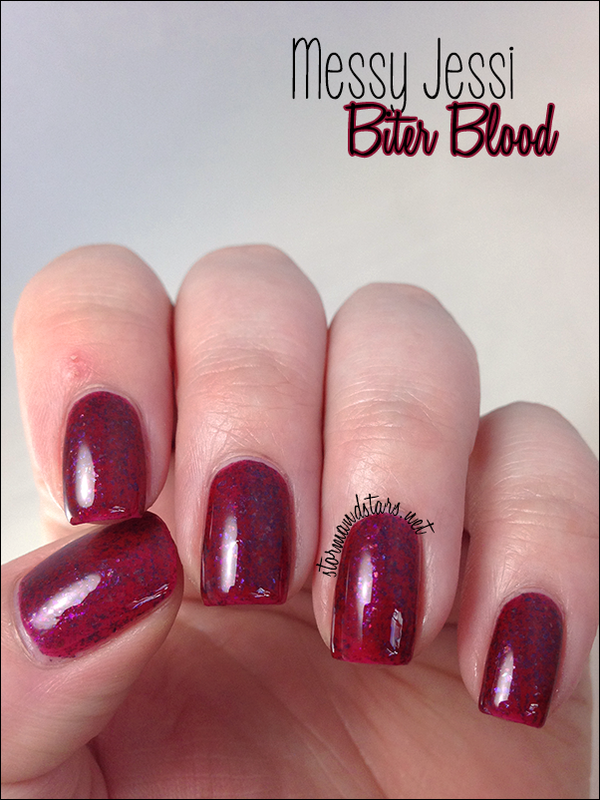 These swatches show three coats of Biter Blood alone plus topcoat. 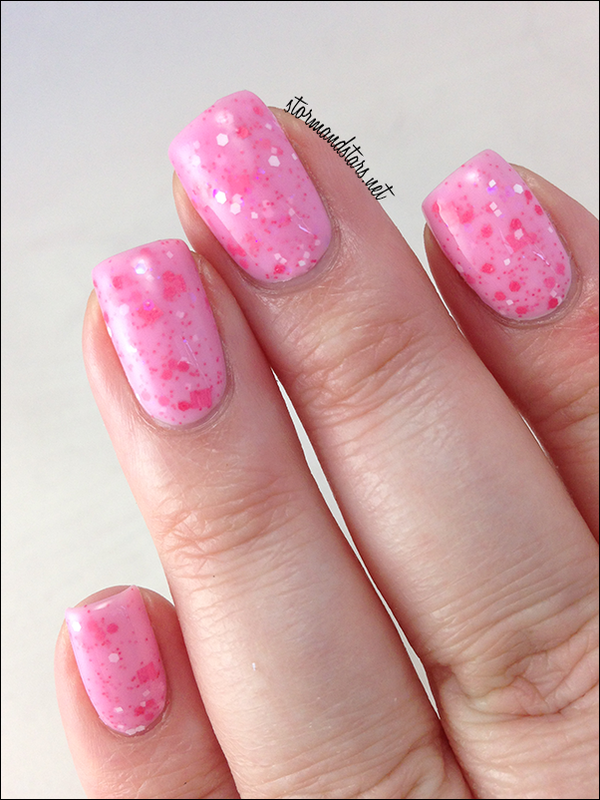 Because of the jelly consistency of this polish you can build it up to more of less opacity depending on your preference. 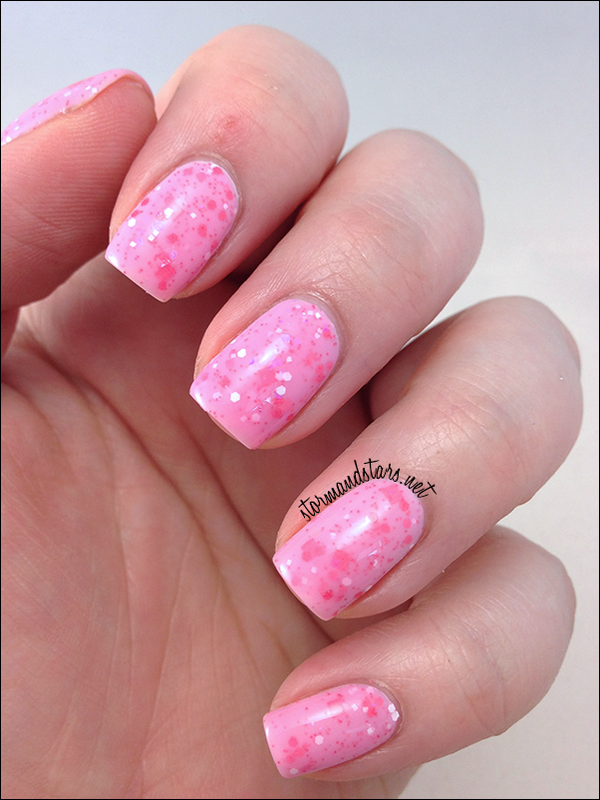 I liked it a lot at two coats as well! This is a must have for the Halloween season! The next polish seems out of place for me in this collection, BUT I don't watch The Walking Dead, so I'm sure for those of you who do, this will make more sense. It is also perfect for Breast Cancer Awareness in the month of October. This is Lil' Asskicker. 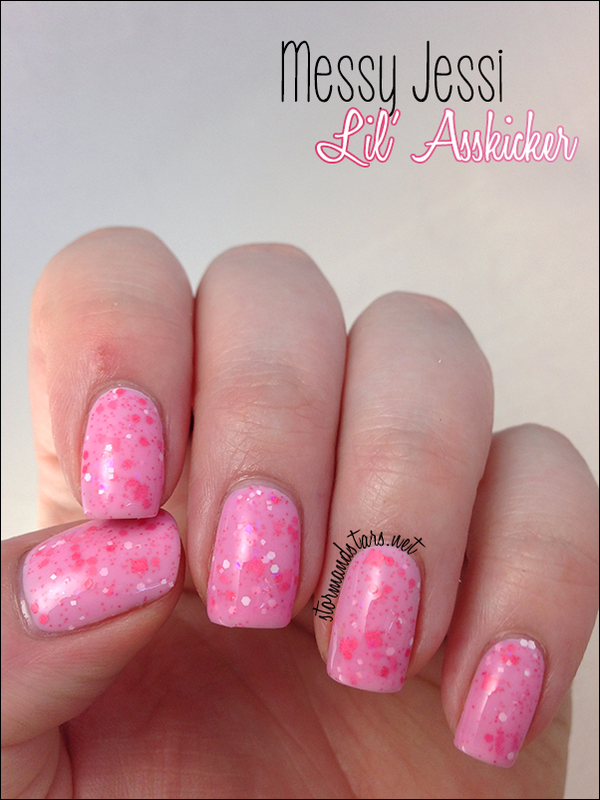 Lil' Asskicker is a light pink crelly polish with pink and white glitters in different shapes and sizes. For these photos I used two coats over white. Personally I love pink, and this color is no exception. I loooove this! I have a few ideas using this color for an awareness mani later this month, we'll see how they pan out! 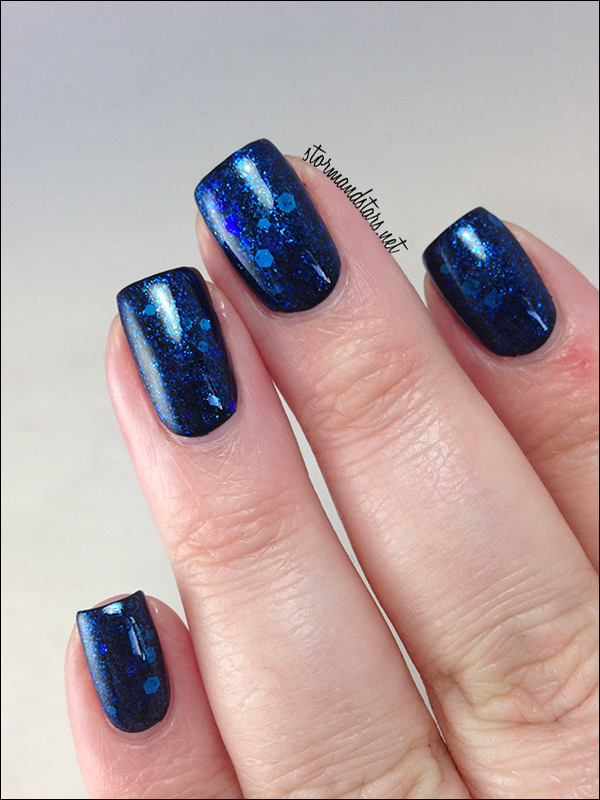 Lastly for this collection is the polish that ended up being my favorite! This is Bow To The Crossbow. 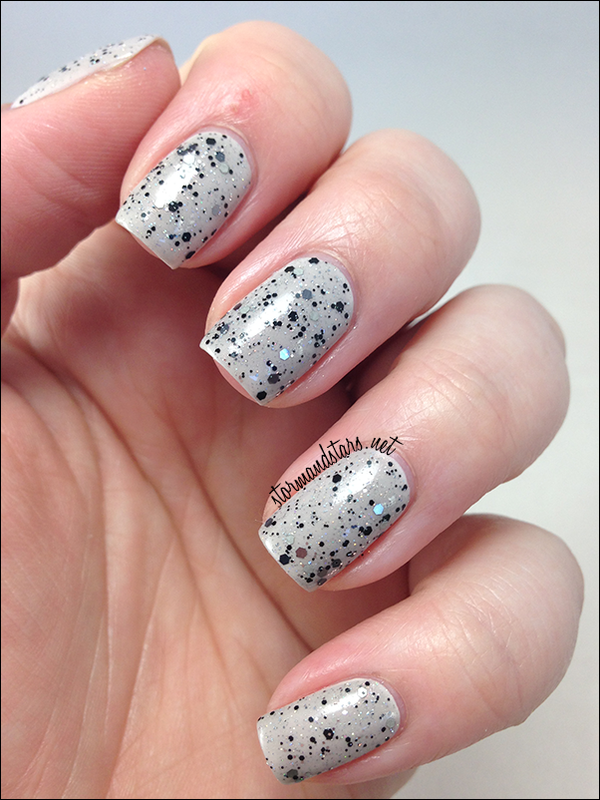 Bow To The Crossbow is a mix of black and gray glitter as well as holo dust in a very sheer gray jelly base. I had a really hard time deciding what to put this over, but I wanted something that wouldn't take away from the beauty of this glitter. I went with an undie of Ethereal Lacquer Macabre with one coat of Bow To The Crossbow. I could have easily layered one or two more coats of this glitter for a darker look but I really love how this came out. What do you think of the Walkers and Biters collection? Did you get any of these during the presale? My must-haves from this collection are Biter Blood and Bow To The Crossbow for sure. Super unique and versatile! 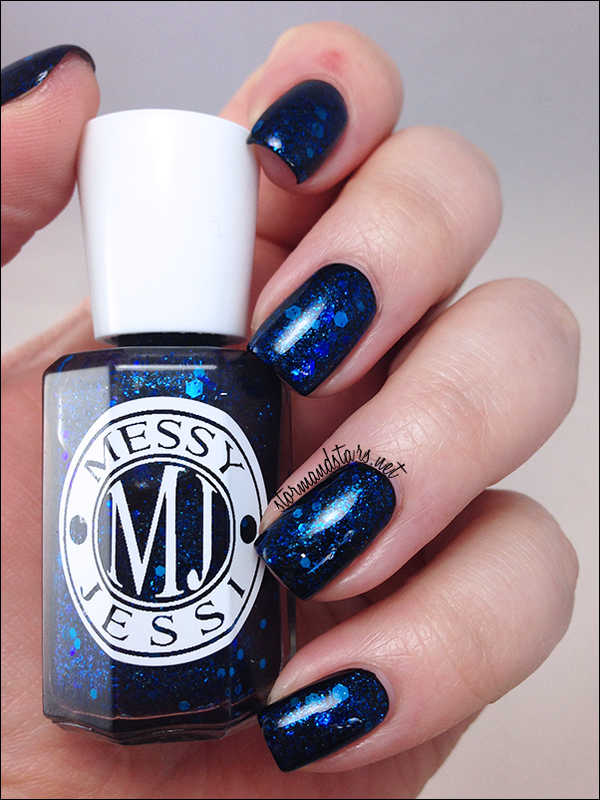 You can purchase Messy Jessi Lacquer at their Shop. There will be a restock of these shades on October 10th! Mark your calendars! Don't forget to follow Jessica on Facebook and Instagram for news and shop announcements as well as more swatches! bow to the crossbow and lil asskicker are so pretty! 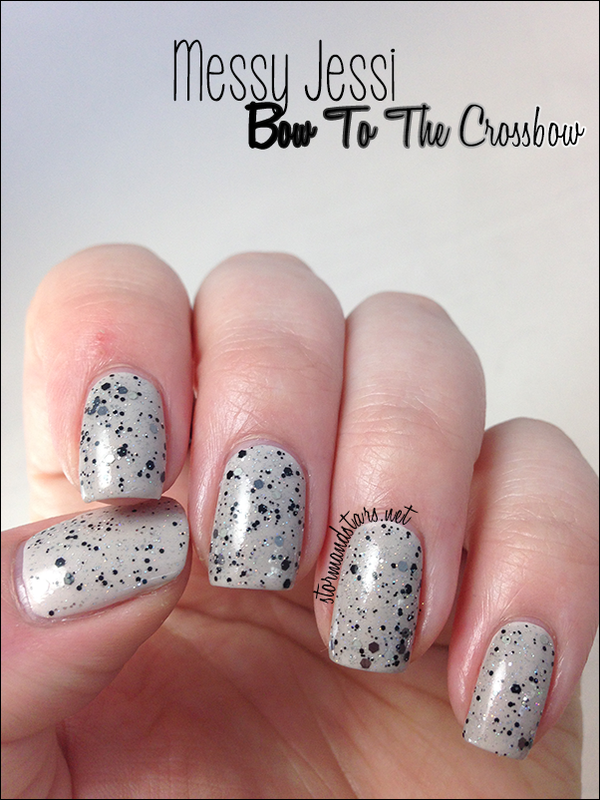 Bow to The Crossbow ♥♥♥ love the holo addition!